I said, “That’s right.” I’d forgotten that. It’s a story in the Politico. It was published on their Politico 44 blog, 44 being the presidency of Barack Hussein O. And it’s dated April 4th, 2013. “Eric Holder: ‘I’m Still the President’s Wingman’ — Attorney General Eric Holder brushed off a question Thursday about when he might leave the administration. Instead, the top lawman professed his allegiance to President Barack Obama. Eric Holder: “I’m still the president’s wingman.” Attorney General Eric Holder brushed off a question on Thursday about when he might leave the regime. Instead, the top lawman professed his allegiance to Barack Hussein O.” Can you imagine if Rosenstein proclaimed his allegiance to Trump, what would happen to Rosenstein? If you are just joining us, the point here is that they’re now trying to go after Trump for being unqualified and unfit because he supposedly asked Rosenstein — I’m paraphrasing; I don’t have the exact question — but, “Are you on my team? Are you with me?” They said Trump was out there carrying out loyalty oaths. And my point is, how could you blame Trump for thinking that the guy running the Department of Justice is his guy after eight years of Obama and Holder and watching them in action? How could Trump or anybody not get the idea that that’s what the job entails? And we have Holder’s own words. “No, I’m not quitting. I’m the president’s wingman,” as he professed his allegiance. He said, “I’m still enjoying what I’m doing, there’s still work to be done. I’m still the president’s wingman, so I’m there with my boy. So we’ll see.” This was an interview on the radio. Well, I don’t know how much more wingman — these guys are not out hunting chicks, that we know of, and that’s generally what wingman is meant to imply. They weren’t out there trying to track down Stormy Daniels in the Make America Horny Again tour, that we know of. 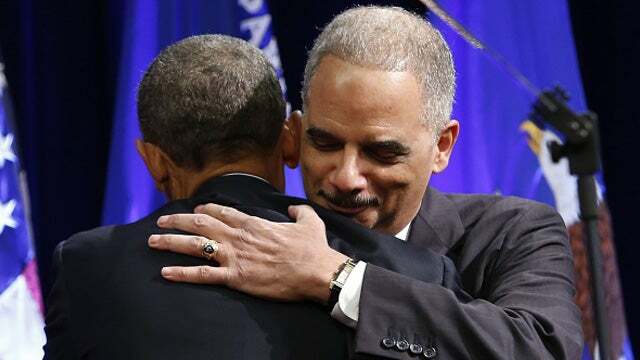 When Holder said that he is Obama’s wingman, it means exactly that politically, ideologically. You guys and all this garbage about Trump demanding loyalty and this or that, again, anybody paying attention could be forgiven their confusion over how things are supposed to operate over there at the DOJ. Isn’t it amazing that when Trump becomes president or when George W. Bush becomes president, all of a sudden the DOJ becomes this hands off well-boundaried institution that the president cannot have any say-so in. The president cannot have a thing to say about what goes on in there. He can’t talk to Jeff Sessions. He can’t talk to the deputy attorney general, he has nothing. He doesn’t understand it, the left says, but the Department of Justice is independent. It must be for a decent and fair America. Right. That’s how they portray it when they don’t control it. When they don’t control it, it means the Republicans have to be warned and bullied into staying away from it. Because the Democrats own the Department of Justice.